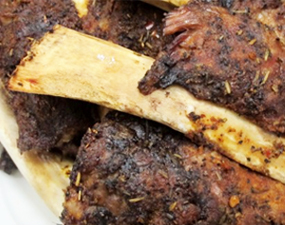 Great beef rib recipe using our new Bone Suckin’ Steak Seasoning & Rub! 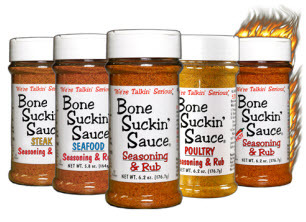 Bone Suckin’ Steak Seasoning & Rub, 4 Tbsp. Score ribs in a diamond pattern on back and front. Using 2 tablespoons per rack, rub Bone Suckin’ Steak Seasoning & Rub into meat on both sides of rack. Cut rack of ribs in half. Line a baking sheet with enough aluminum foil to completely cover ribs and crimp sides to seal the foil. Bake in oven for 3 hours covered and 15 minutes uncovered at the end of cooking time. Recipe serves 4.